Three months of Bible readings to help you investigate Easter, to meet Samuel and Saul and to dip into some psalms. I got this book in the run-up to Easter as it contains relevant passages from Mark, & i needed an antedote to bunnies and chicks and chocolate! We hadn't used Table Talk before and have a 4yr old daughter, preschool yr so can't read yet but I wanted a bit more than Beginning with God which we have used up to now. After doing it a few times she has really quite taken to it & even reminds Daddy when he comes home from work to do it. I like that we are reading out of the actual bible, not just the usual stories that appear in children's bibles. We're now going thru some Psalms which is just great& new for her. I had wondered if it would be a bit beyond her but so glad we gave it a go, plus you don't have to do every single suggestion given. As its not dated we can revisit it again in more depth later on. All in all - worthwhile investment. 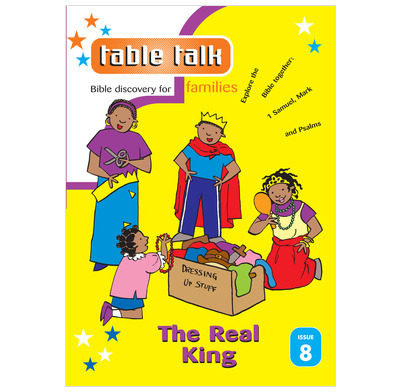 We have used a number of Table Talks over the years and find them really helpful as a focus for a family 'quiet time', especially with primary school age children.